Mayor Norma Redfearn CBE, right, with Rebecca Allcock, MD of Monitor Coatings, North Tyneside Business of the Year. Picture by The Bigger Picture Agency. The best businesses in North Tyneside have been honoured at an annual awards. The 21st North Tyneside Business Awards celebrated the contribution the organisations made to the local economy, helping the borough be a great place to live, work and visit. Organised by the North Tyneside Business Forum and held at the Spanish City in Whitley Bay, the event was hosted by comedian Jason Cook. Mayor Norma Redfearn CBE, said: “Congratulations to all of the winners and finalists who have been recognised here. This year there were five sector categories with the winner of each category being automatically entered into the prestigious ‘Business of the Year’ award. And the overall Business of the Year award went to Monitor Coatings. There was also the Heart of the Community Award, which was nominated and voted for by the public, which went to Carney Consultancy Ltd.
Monitor Coatings, based in North Shields, is a technology leader for surface engineering in extreme environments and was one of the first UK companies to receive the an international Aerospace accreditation. They are currently developing and applying an innovate coating for the Royal Navy’s HMS Queen Elizabeth and Prince of Wales carrier decks. Rebecca Allcock, Managing Director of Monitor Coatings said: “We’re absolutely delighted to be named North Tyneside Business of the Year. “Monitor Coatings actively recruit from the local area where home time served ship building skills exist. David W Bavaird, Chair of the North Tyneside Business Forum, said: “I’d like to say huge congratulations to Monitor Coatings on winning the award. 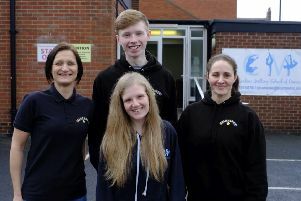 “They were chosen for a number of reasons including being proud of their history and leading on innovation, making the best use of new technology and local skills. For the fifth year, the Special Contribution Award was presented; awarded to the business which has made the biggest impact on the local community and economy of North Tyneside, with SMD picking up the honour.